Alright, I know what you're thinking. 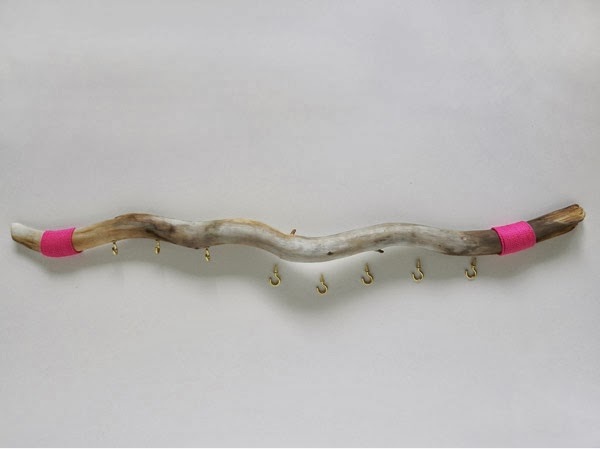 It's the middle of January and I am posting a DIY about driftwood, but I promise just about any old stick will do. The driftwood I used was found over the summer at a lake in western Nebraska, so I decided it was about time to show you what I made with it. Also, with the new year upon us, I have been on an extreme organizing/de-cluttering kick and this little project is just the thing to help manage my growing necklace collection. 1. This might seem like an obvious first step, but finding the right piece of driftwood for this project is important. Look for a piece of wood with good coloring and enough curve to give it interest, but not so much going on that it will look cluttered when hung with necklaces. 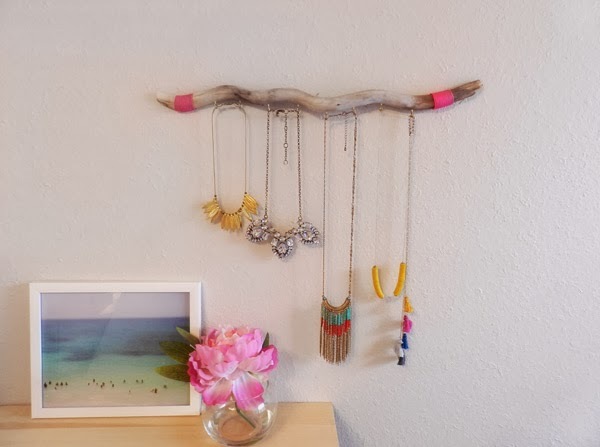 Also, imagine how the driftwood will hang on the wall and make sure there are at least two areas that you will be able to drill holes into in order to hang the final project. 2. Next, clean your driftwood by removing any unwanted bark and use a fine grit sand paper to smooth things out a bit. You don't have to go crazy with this step, but I found that the ends of my driftwood were a little rough. Also, if you're unhappy with the natural coloring of your wood, I would suggest bleaching it. I read these (1,2) articles about bleaching driftwood and found them to be very helpful. 3. 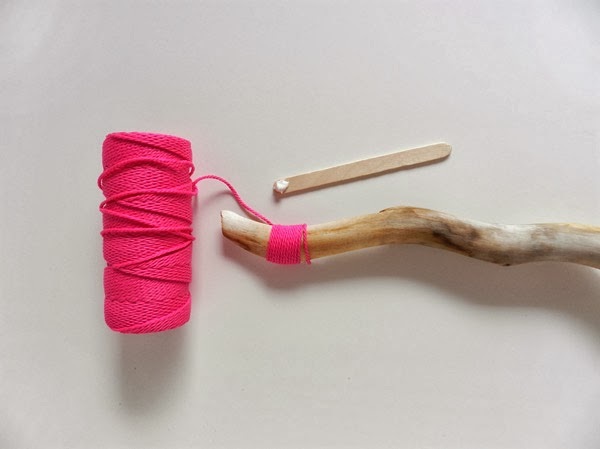 Once your driftwood is prepped and ready to go, add a dab of glue and wind a small section of mason twine around end of the driftwood. You can skip this step if you prefer, but I liked the pop of color it added. You could also try painting a design on either end to get a similar effect. 4. 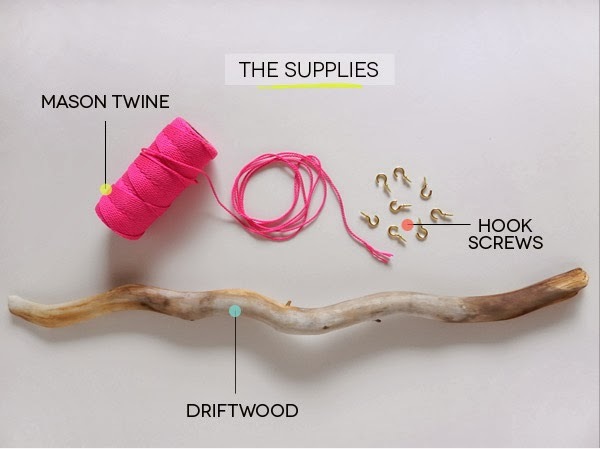 Next, evenly space your hooks and make small marks on the underside of your driftwood to determine where each hook will go. My driftwood was pretty pliable so I was easily able to screw my hooks into place by hand. If needed, use a small pair of pliers to secure each hook into place, making sure not to over-tighten them, which would cause the wood to split. 5. 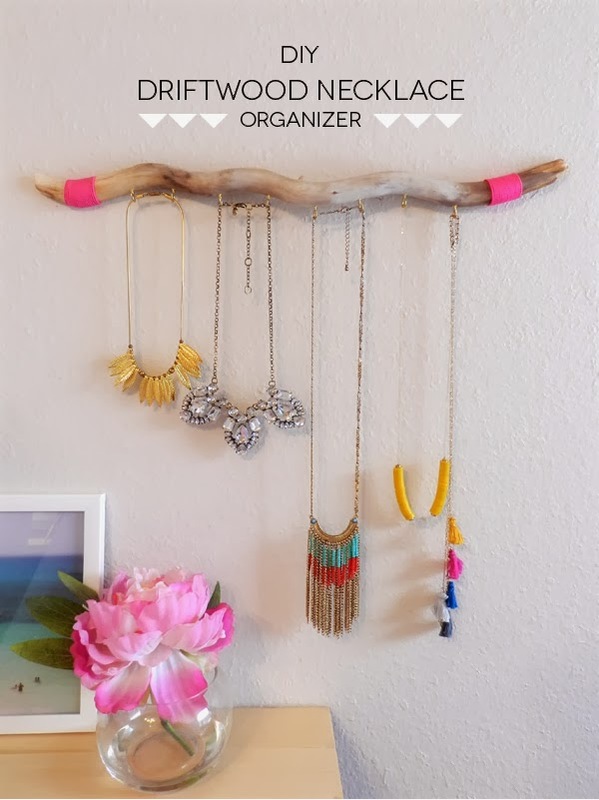 Lastly, drill two small holes into the backside of the driftwood so you are able to hang the finished necklace organizer to your wall.